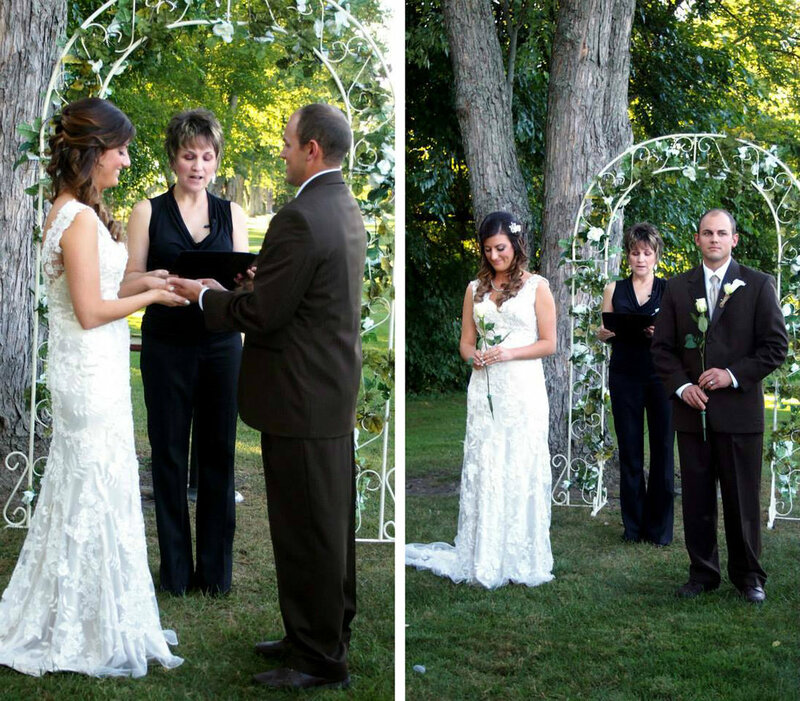 As a wedding officiant I see marriages all year long and here I was at Dock 580 venue in Columbus, Ohio! Helene and Michael were the bride and groom and they chose a sand ceremony to add meaning and symbolism as two people, and two families, became one! The extra jars of sand were for the groom's children and the completed ceremony demonstrates the union of all the members of this new family, now inseparable! The Outdoorsman and the City Girl! Jean had a wonderful time at Blake and Camille's wedding! 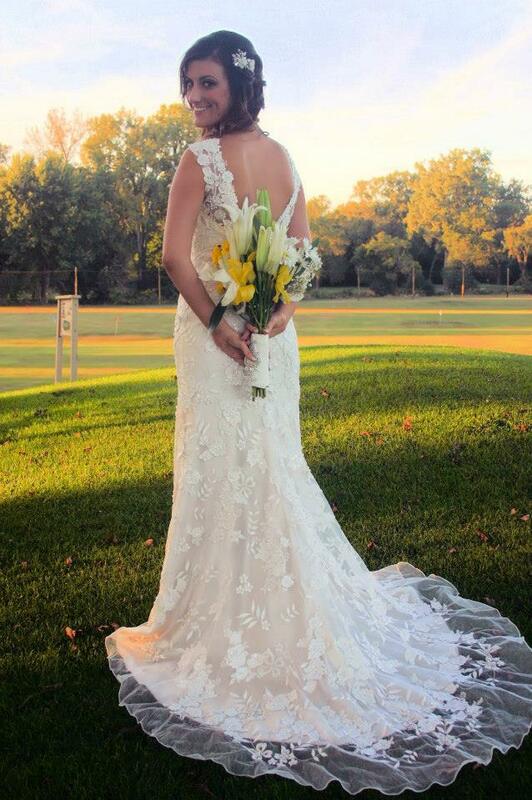 She was their officiant at London Country Club just west of Columbus Ohio! Wedding officiant, Jean King, with Camille & Blake at London Ohio near Columbus. Image: SunFirePhotoPlus ...to even shooting a compound bow, Blake found someone who he calls a great friend to himself and others and a true companion with every adventure. And Camille didn't expect Blake to carry her through life's struggles and losses from so early on in their relationship but from it, they were able to build an undeniable trust. Such a trust that Blake didn't remember to pop the question when he got down on one knee! So Camille had to ask, 'Well are you going to say something?' And with his continuous smile she had to say 'yes'." 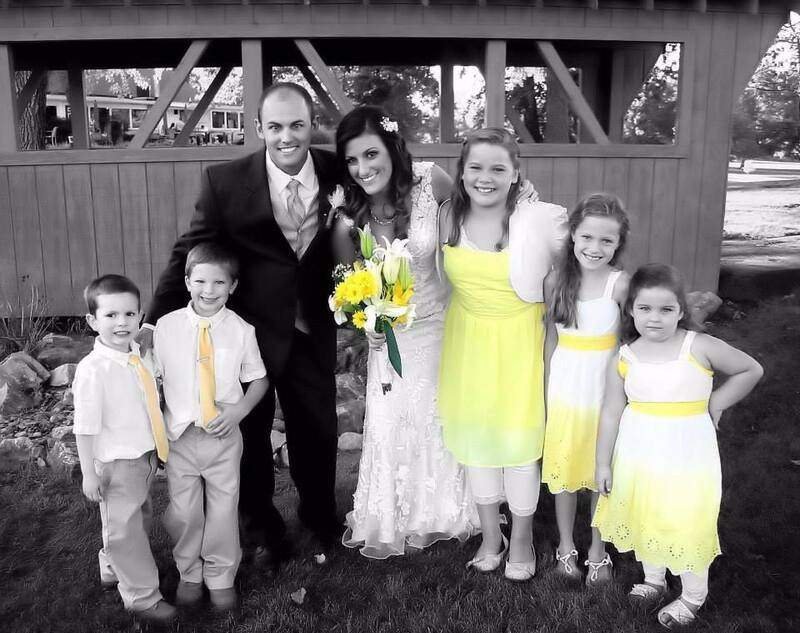 Bride and groom, Camille and Blake, with "junior staff" at their wedding in London Ohio! Image: SunFirePhotoPlusIsn't that a great story! We wish all the best for you, Camille and Blake, as you continue into your future together! Photos in this entry are courtesy of Sunfire Photo Plus and Kelly Kirkpatrick. Her phone number is 614-619-3552 and her email is sunfirephotoplus@gmail.com. 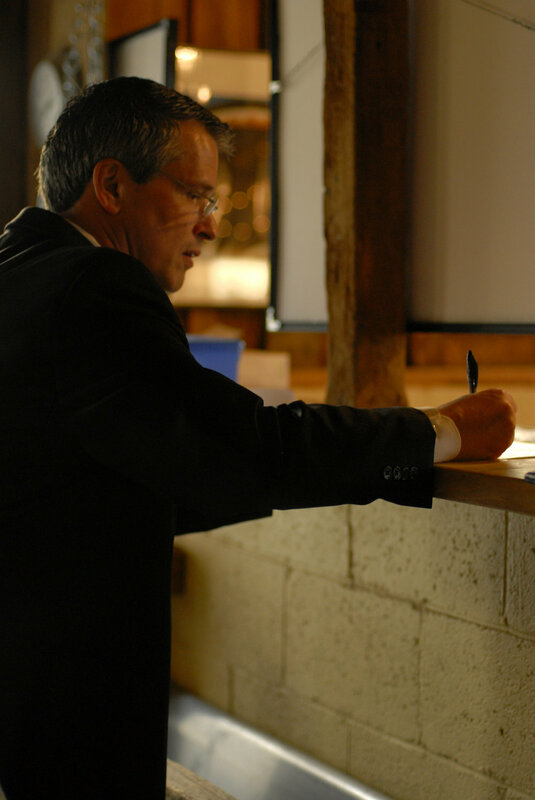 Your wedding officiant will need to sign, date, and return the certificate of your marriage license to the Probate Court after your ceremony! Bride and Groom's Marriage License from Franklin County Probate Court Columbus, OhioThe one shown here was returned to Columbus, Ohio, where the seat for Franklin County is located, after a beautiful wedding at the Pinnacle Golf Club in Grove City. This process is the only way that the government has proof that you are no longer a groom and bride, but a husband and wife!! Now the rest of your life together awaits you! Franklin County has an excellent website for all of your marriage license questions. Just select the link provided to check it out! No photographer is mentioned because this was a photo I took! Bride's bouquet is amazing. Yes, that is butter in the right hand corner, however, it is in the shape of flowers. What fun. 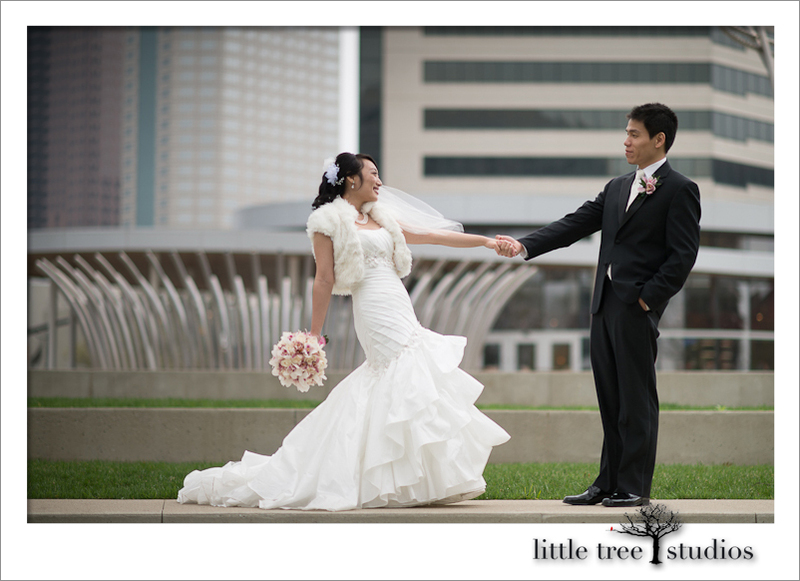 Darlene and Don enjoy a special moment on their wedding day in Greater Columbus Ohio. 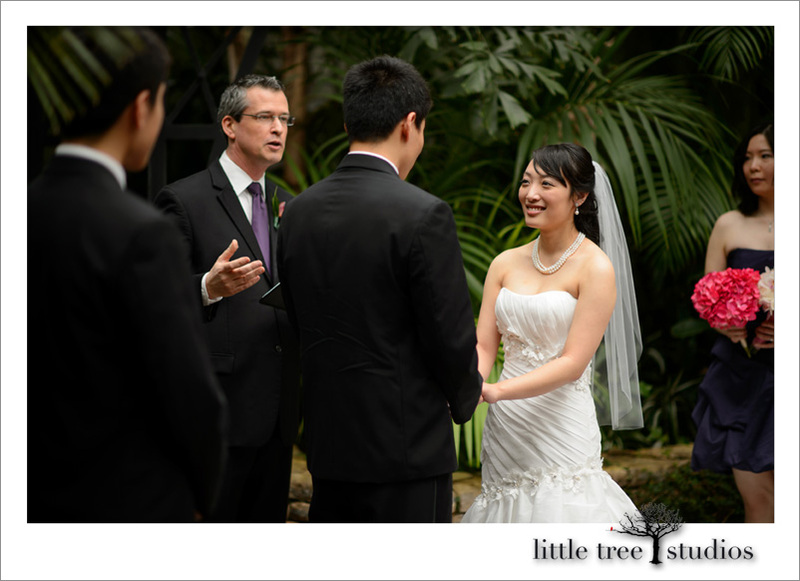 They needed an officiant and had a friend call me first. Their friend explained how they wanted a simple, yet intimate and meaningful ceremony at Jorgensen Farms in Westerville. The bride and groom scheduled a meeting with me at our office and we began to design their personalized ceremony on the spot. Darlene and Don's wedding day in Columbus Ohio at Jorgensen Farms.As you can see in this second photo we were having a lot of fun and enjoyed a great rapport. 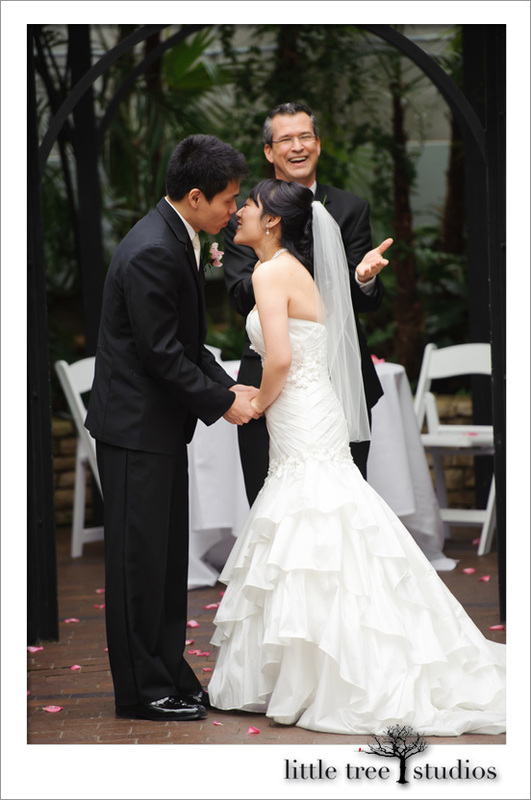 Wedding Officiant, Damian King, enjoying fun with bride and groom near Columbus, Ohio.You may kiss the bride! Darlene and Don kiss at their wedding ceremony in greater Columbus Ohio. Location was Jorgensen Farms in Westerville.Darlene is filled with excitement and expectation, and feels happy and satisfied as the newly married bride! Bride's face says it all at her wedding ceremony in Westerville at Jorgensen Farms.Now I take care of the marriage license. We want to make sure their marriage is legally recognized. Marriage License signed by wedding officiant Damian King of Columbus Ohio.Here the sun shines through above us as I stand with this happy couple. I like to think of it as a "good omen" for their future! 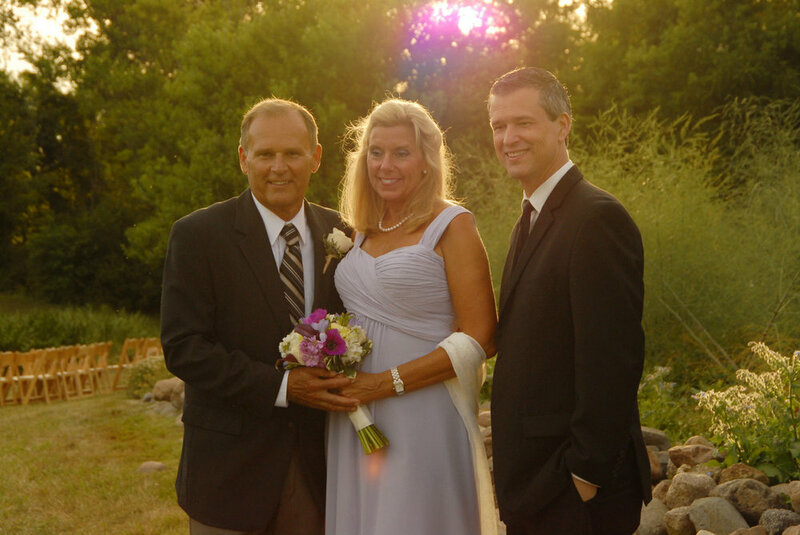 Darlene and Don at their wedding standing with their officiant near Columbus Ohio at Jorgensen Farms. I really like this country-style wedding sign with the candles. I felt it was a very nice touch! 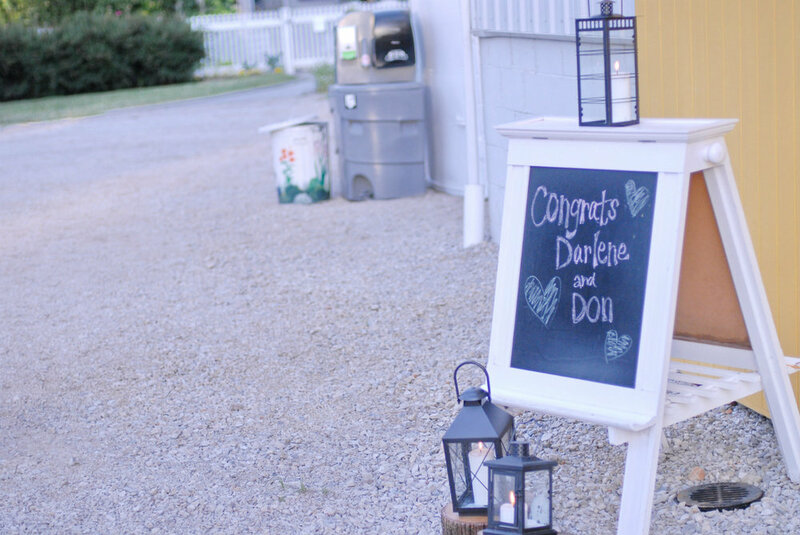 Candle lighting and wedding sign for bride and groom, Darlene and Don, in country setting at Jorgensen Farms. The photographs in this entry were provided by Open Prism Photography and the work of Rebekah and April King. You can contact Rebekah and April by visiting their website at the link provided or by calling 614-653-9082. You can also email them at openprismphotography@gmail.com. Ian Jones and Columbus Musicians LLC fantastically provided the music. Carly Ziemer and Two Caterers provided the food! It was my privilege to celebrate with Darlene and Don as their officiant on that very special day in Columbus, Ohio! Thanks for visiting our website! Fun wedding in Columbus, Ohio.... more comments posted below, after the photos. Damian King pleased to be the wedding officiant for Joanna & Aaron at a Columbus, Ohio ceremony. Bride, Joanna, enjoys a fun moment with her groom, Aaron, and her officiant at her wedding in Columbus, Ohio Joanna enjoys a precious and joyful moment with her groom. 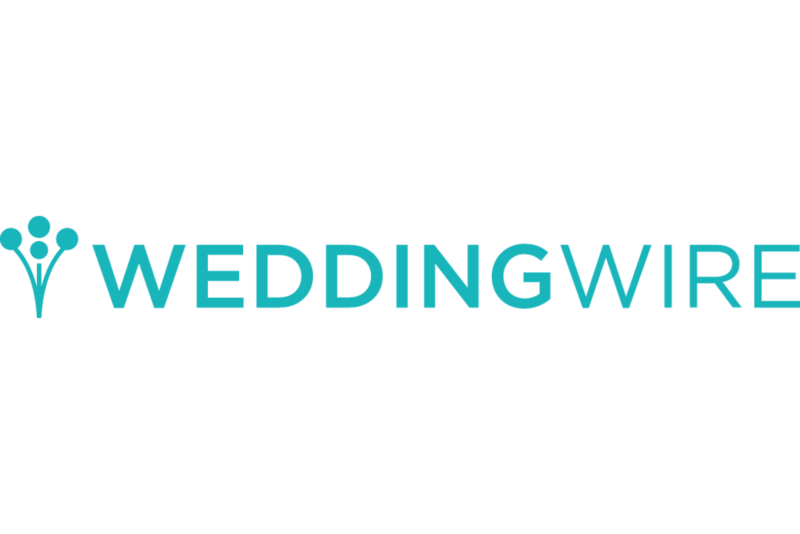 Wedding officiant, Damian King presides. Happy bride hugs officiant, Damian, at her wedding in Columbus, Ohio. Husband and wife happy on their big day! Radiant beauty. 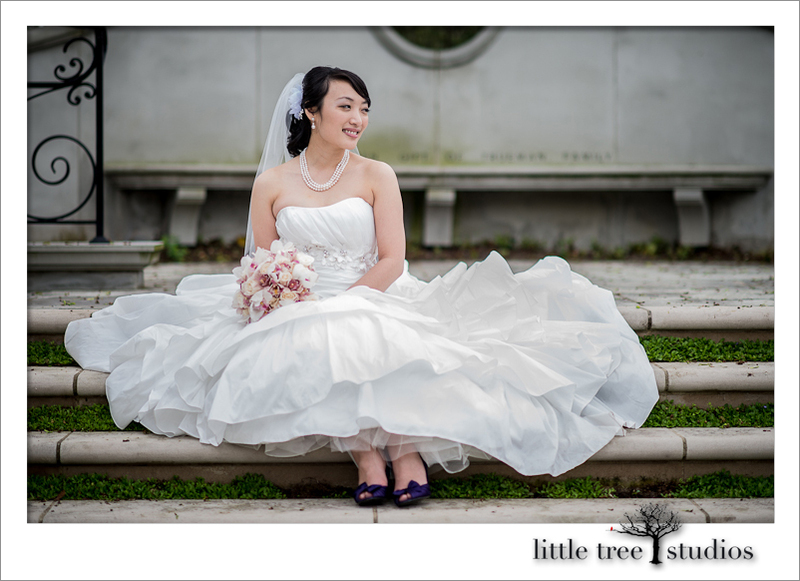 Photo by Little Tree Studios - Columbus, Ohio Another wonderful display of beauty - Bride, Joanna, after her wedding at Franklin Park Conservatory Joanna & Aaron enjoy a fun moment in downtown Columbus. "What does our future hold? I'll be happy as long as I'm with you." "Can we just stop time, and stay here awhile? I am so happy we met. 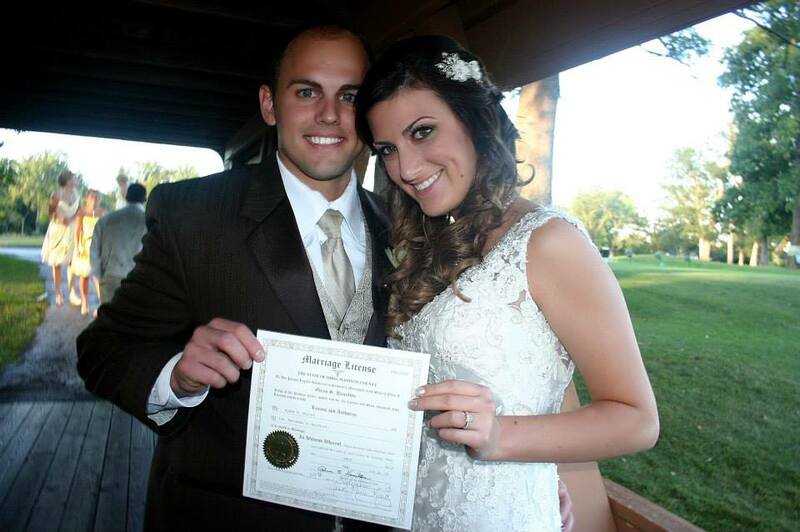 "As the officiant for Joanna & Aaron I had the joy of participating in this couple's dream of a western ceremony. They did hold to some of their Asian traditions, though, which is why you see Aaron standing to my right, instead of my left. 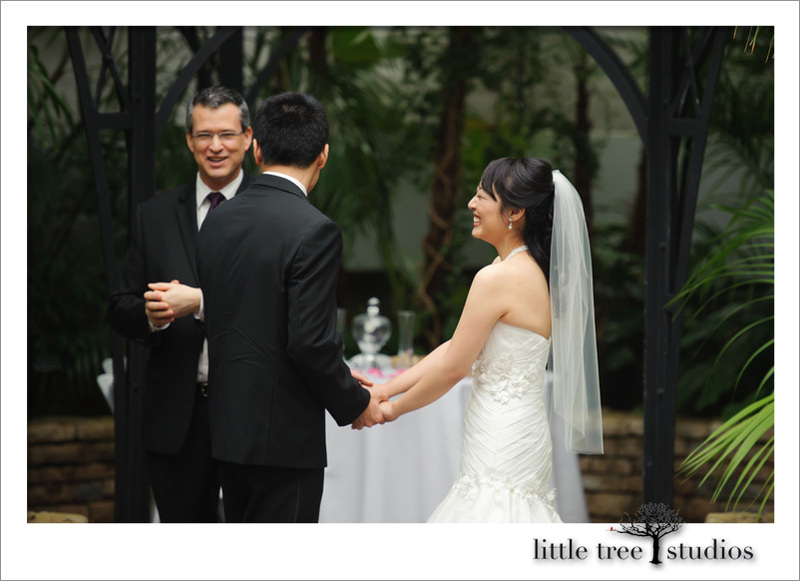 They were a beautiful couple and I was so happy to celebrate with them on their special day at Franklin Park Conservatory. 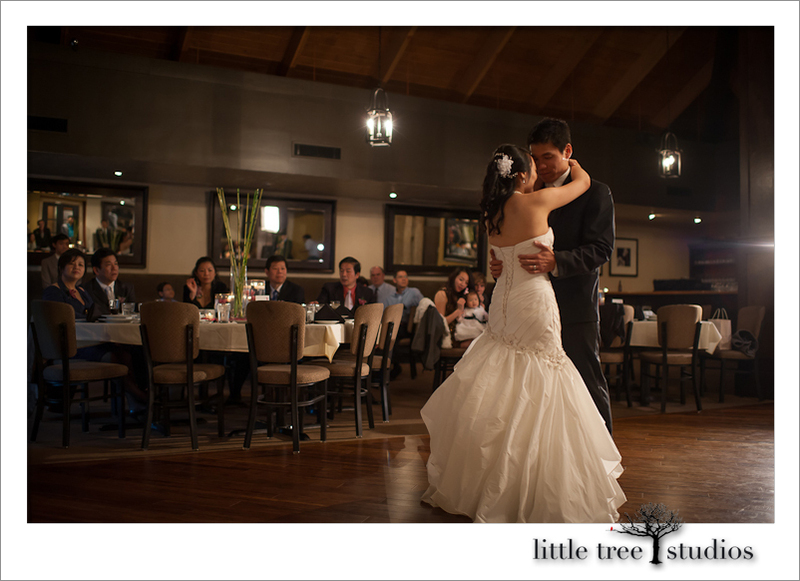 Kyle Maza of Little Tree Studios took these incredible photos. You can contact Kyle or her husband, Steve, at by visiting their website in the provided link or calling 614-985-1671. 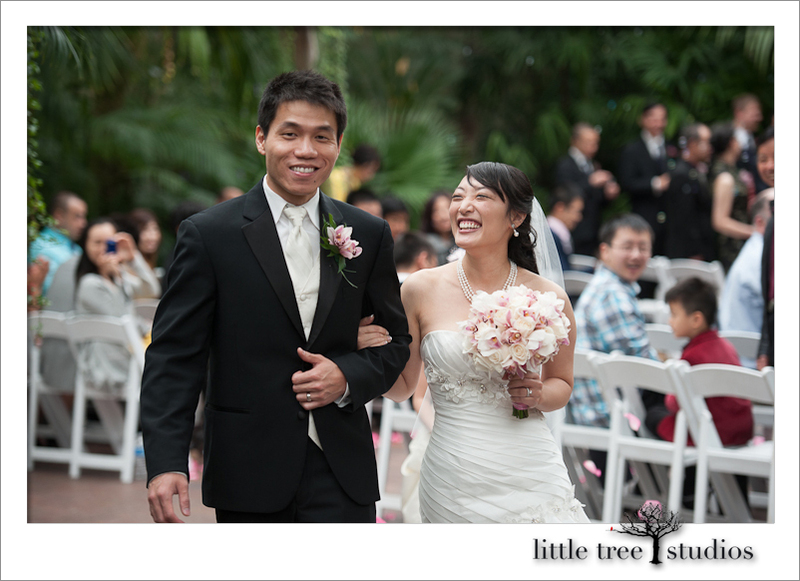 Email works as well at info@littletreestudios.com. 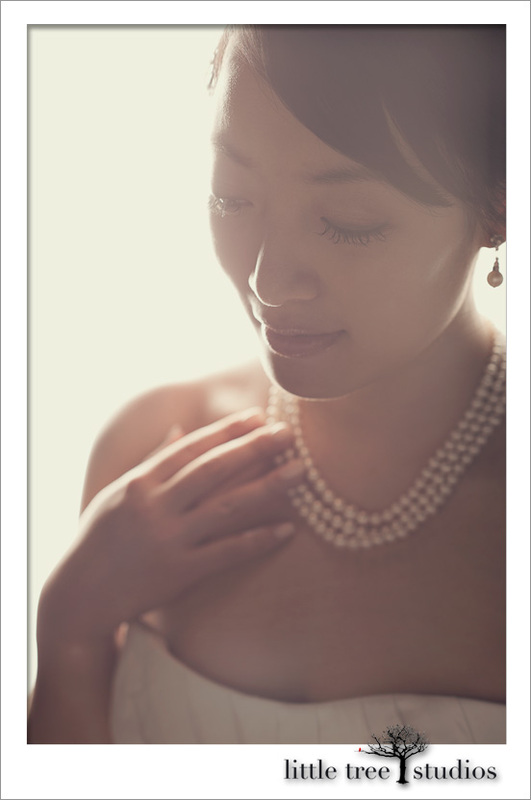 I love this photo taken by a friend of Rachelle and Matt after their wedding. I felt fortunate to be the wedding officiant for this dedicated couple as they became husband and wife that day in Columbus, Ohio. 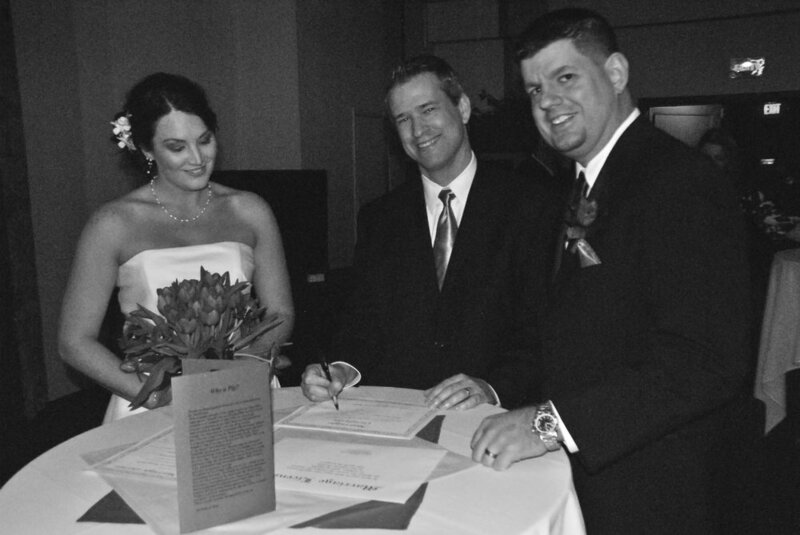 Signing the marriage license is the last step of the process. 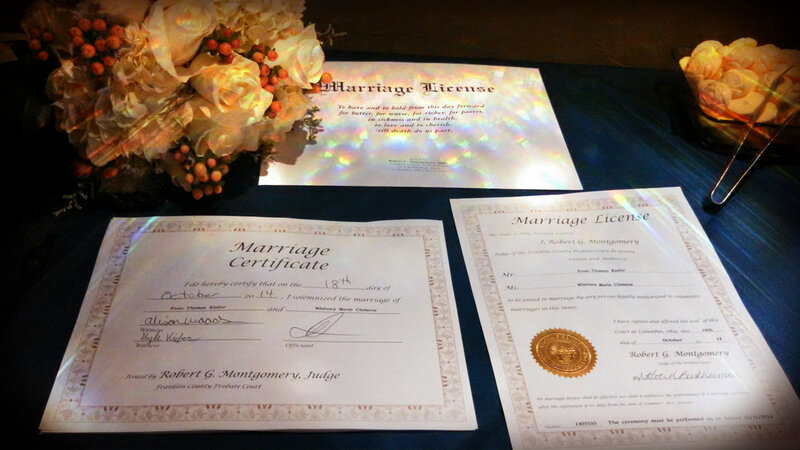 The couple's marriage certificate is signed and filed with the county, and then the probate court certifies the marriage on the county records. Then the couple can request their "marriage abstract", which is the document that says they are married. The marriage abstract is the document that a new wife presents to the Social Security Administration for her name change. For more information about applying for and certifying your marriage in Franklin County, follow this link to the Franklin County Probate Court - Marriage License Department. They have some great information there that couples find very helpful. Thanks for visiting my website and have a great day!